I skinned two ducks the other day; the guy who shot them really did a number on one in particular. 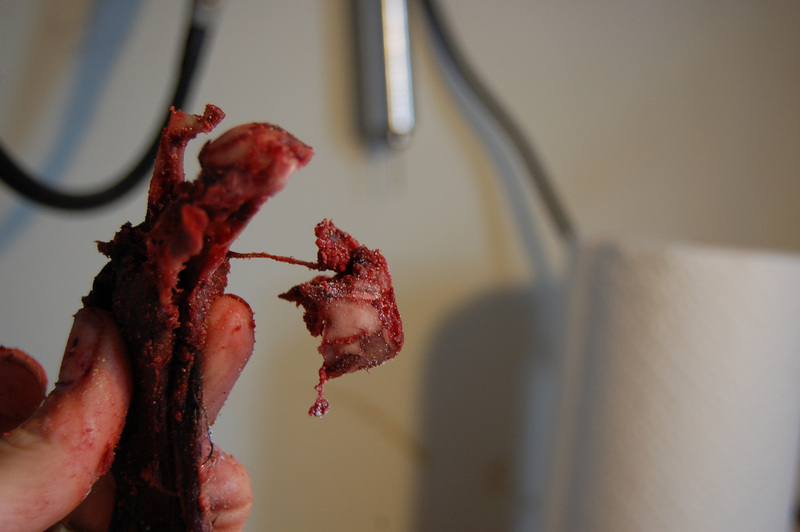 I originally was going to post some pre-skinning pictures but it occurred to me that it might be a tad too graphic. Let's just say that the head was crushed, legs were broken and wings were bent. Definitely a fixer-upper. Here's the skull itself; perhaps you can imagine how distorted it may have looked with the skin on. I actually don't mind so much when the head's a bit smashed; it makes the skull easier to clean as I don't feel the pressure to be so gentle with all the little nooks and crannies. Every time I clean a bird skull, I hear my instructor's voice in the back of my head: "Just attack it. Attack that skull." And that's what I do. I get it as clean as possible and have even developed some of my own techniques post-school to achieve maximum spotlessness. Ducks have a fair amount of brains, (of which extracting is my favorite part of the process) and I'd like to try brain tanning sometimes soon. After spending two days skinning the chicken and the two ducks (most seasoned taxidermists would have had all three skinned, degreased and mounted in one day, by the way) I couldn't get my mind out of the dissection zone and everything around me was looking like a specimen. This happens to me from time to time and it can be difficult to shake. I look at everyone's knees and see the tendons I've so effortlessly been slicing on birds. I feel around my throat with my hand and conjure a mental image of a my slit wind pipe, open and exposed right next to my draining jugular. I pet my cats and think how easily the tail skin slips right off the bones of a mouse. As grotesque and disturbing as it may sound, please rest assured that I am not about to go all Norman Bates on everyone. I'm just seeing things very anatomically right now. 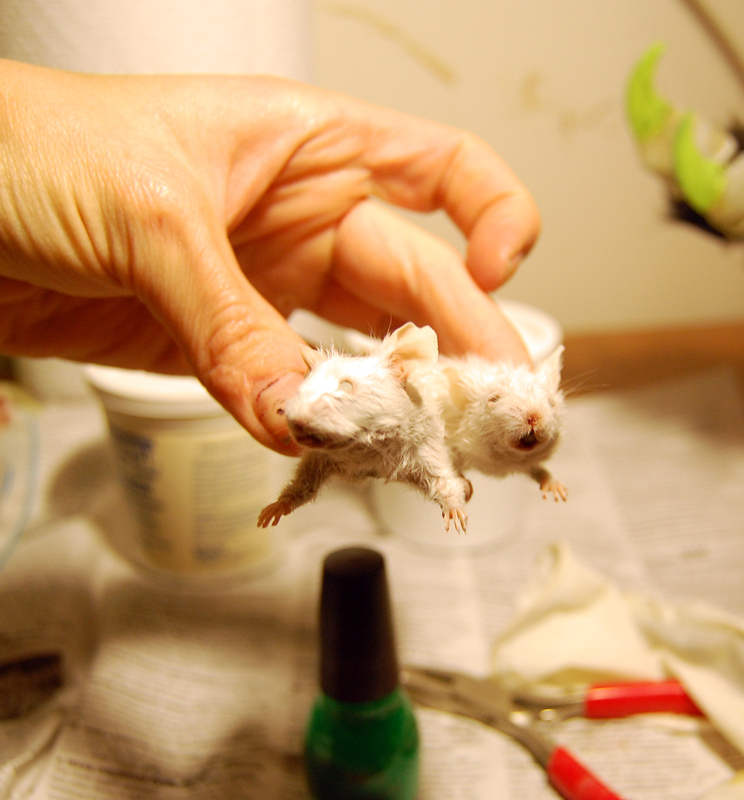 Once you become intimate with the sight, smell and touch of the insides of a creature ( a mouse's delicate and miniature intestines, for example) you don't look at them the same. I'm sure Med students must go through this in spades. These guys/this guy isn't finished yet; I still need to fix up the faces and add in eyes. Its kind of a Siamese twin mouse. I bought these feeder mice (already dead and frozen) from a pet shop; and intend to throw the carcasses into the alley down the way for all the hungry stray cats so they won't go to waste. 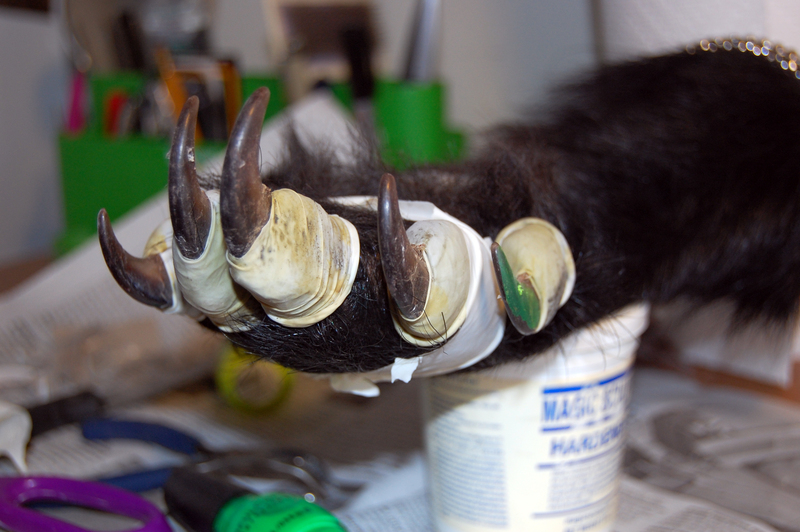 And while all this was going on I was adding coat after coat of polish to my bear paw. It took some brainstorming to devise a method in which I could paint the nails without the fur getting in the way, but I'm on the right path.